SafeHouse Chicago celebrates National Spy Day (April 12th) with an event themed after The Office, Threat Level Midnight. The iconic episode features Michael Scott’s movie script including a riveting story about crime-solving secret agents. SafeHouse’s take on the episode turns the covert spy-themed lair in to a set for Goldenface and Michael Scarn to solve their secret missions. 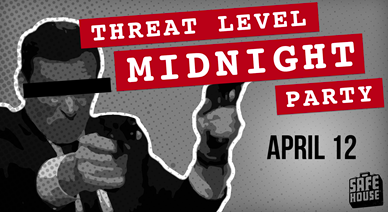 Guests are encouraged to dress up as their favorite Threat Level Midnight character, and will receive a Special Agent nametag for their midnight endeavors. The party includes a DJ to play hits like “The Scarn” dance, photo booth access, and The Office episode reruns on Control’s Screens. Guests can win a $100 bar tab for the best-dressed, or an overnight stay at the AC Hotel for purchasing a ticket to the event. From James Bond to Michael Scarn, SafeHouse’s spy experience is brought to life through the space’s hidden tricks, escape routes, and spy gadgets. Threat Level Midnight begins at 10 p.m., and unlimited well cocktails and draft beers are available until midnight. Guests can purchase their tickets on Eventbrite ($35).